After meeting with the Inter-Fraternity Council (IFC) for their AMS elections endorsement meeting, I have decided to reject their endorsement of my campaign for re-election as AMS VP Academic and University Affairs and student Senator-at-large. During the meeting, I realized that my values and those of the IFC leadership are incompatible. The opinions expressed to me by the IFC leadership regarding campus sexual assault during the endorsement meeting are fundamentally at odds with my own beliefs and my election’s platform. It became apparent to me that IFC leadership cares more about the image of their institution than the systematic abuse survivors have experienced. After presenting my platform, members in the room were allowed to ask questions. The first question I was asked came from the IFC president who wanted to know what I meant by “survivor centric support.” I explained that survivor centric support is built off of the idea that we don’t judge the accuracy of a survivor’s disclosure when offering accommodations, and that we prioritize the support and choice of survivors first. I was happy to explain what is a very important platform point both personally and professionally. IFC leadership continued to ask questions, including a question relating to whether those accused of sexual assault would receive accommodations. At the time, I was surprised by the question and answered that I couldn’t think of many scenarios where they would need accommodation. Looking back now, there are some accommodation scenarios I can think of — as an example, academic accommodations during an investigation. The president then told me that he could think of a scenario but did not elaborate. Continuing our conversation, IFC leadership brought up the issue of false accusations. I made it clear that the literature and research show that false accusations make up a tiny percentage of reports. Also, I made it clear that accommodations offered to survivors do not assume the guilt of the accused, but assume the trauma of the survivor. At one point, another fraternity leader brought up an example where he thought housing accommodation would be appropriate for someone who has been accused and should be offered by the AMS. He talked about how a member of his fraternity had been accused of sexual assault and that girls in sororities did not feel comfortable coming to their fraternity house parties anymore. I answered by making it clear that the AMS doesn’t have the resources to offer housing accommodations to those accused of sexual assault. I also made it clear that the AMS does not have the ability to remove someone from their current housing if they are accused. I pointed out that by making someone leave their current housing, they were assuming guilt in this scenario. At this point, it was clear to me that the priority was not the safety of the sorority members or fraternity members, but rather the attendance of women at their house party. Later in the questioning, the IFC president brought up that using the word “survivor” could be stigmatizing to the accused because it assumes their guilt. At this point, as a survivor myself, I began to both feel uncomfortable and unsafe in the environment I was in — but I understood that as an advocate for students, I had to make my point clear. I told everyone in the room that the word “survivor” does not assume the guilt of the accused, but rather assumes that someone has experienced an extremely traumatizing event and needs our support. The conversation began to wrap up, and I ended by saying that I would review the issue but stay committed to survivor centric support. They thanked me for my attendance, I thanked them for listening to me and I left the room. Afterward, I spoke to friends to calm down after what was an event that made me both emotional and gave me some of the worst feelings I’ve ever had as a survivor. It is disappointing that despite the passing of Policy 131 and the continued fight to implement a survivor centric approach at UBC, that some leaders in our community are still resistant to supporting and believing survivors. I also recognize the privileged position I am in, as an uncontested incumbent candidate, to be able to publicly challenge what was said at this meeting and to stand for the values I believe in. I hope that members of the Greek community will still support my campaign and the values I stand for as an advocate for all students. As a survivor, as a student and as an advocate who firmly believes in survivor centric support, I cannot accept an endorsement from an organization whose leaders support the views expressed at this meeting. 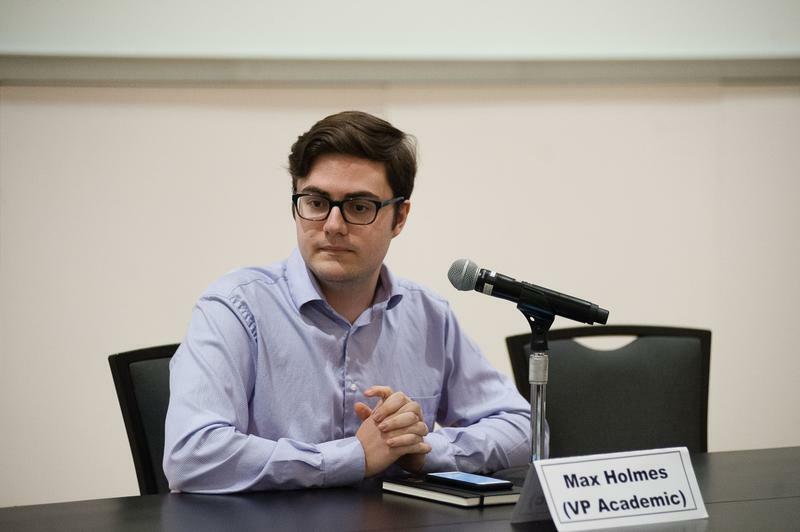 Max Holmes is a second-year arts student, AMS VP Academic and University Affairs and a student member of the UBC Vancouver Senate. All opinions expressed in this article are his own.